Izzy Brannick was trained to fight monsters when she was a little girl. Everyone in the Brannick family were monster hunters, but the all the Brannicks passed away all but Izzy and her mother Aislinn. Izzy’s sister Finnley was a huge part of Izzy’s life, and her only friend until she mysteriously disappeared on a mission. Izzy and her mother tried to find Finnley after she disappeared, but they didn’t find anything. Finnley could’ve been dead or she could’ve been alive, but they never found any evidence. On a normal mission, Izzy would kill vampires, werewolves, or banish ghosts. On missions, Izzy liked to have fun, and to banish a ghost, all she needed to do was pour salt where the ghost’s grave was. This was not Izzy’s idea of a fun mission, although this was how ghost hunters had always done it. “That’s why they’re so un-fun to hunt,” said Izzy on one of her missions. But when an unusual haunting case appeared at Mary Evans High School, where Mr. Snyder, Mary Evans High’s biology teacher was killed in a room by himself with a microscope, Izzy was determined to find, and kill the monster that did this. The mission called for Izzy and her mom to move to Ideal, Mississippi to be closer to the school. Izzy also had to attend the high school, and she had no idea what to do. Since her closet consisted of the usual hunting outfits, black jeans, black tee-shirts, black boots, and black sweatshirts, her wardrobe needed a few adjustments. In her training, Izzy was taught to never get attached to anyone new, but she wasn’t sure if she could solve this case without her new friends Dex and Romy. Izzy was having a hard time with living in Ideal. She was used to her normal, homeschooled life, but she had to face a huge challenge, and she didn’t want to get hurt by holding onto this life and her new friends since she had to move back to her original home when she was finished with the mission. Izzy had to persevere and address this problem before anyone else got hurt. 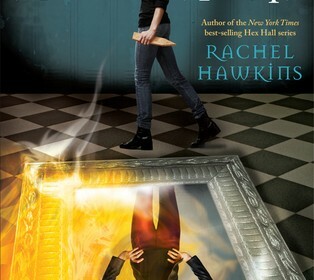 School Spirits, by Rachel Hawkins is a mysterious and eerie book for anyone who likes ghost stories, or paranormal activity. If you like books that get your heart beating fast, this is the book for you. School Spirits is an action packed story that has romantic elements and adventure. School Spirits is an amazing story about the new girl in town who needs to face all the drama of a regular teen.